Allie graduated from Northeastern University with her Bachelors of Rehabilitation Sciences followed by her Doctorate of Physical Therapy. Throughout her time in school and clinical rotations, she was exposed to a variety of orthopedic conditions, solidifying her love for the orthopedic population. She completed her clinical rotations in Braintree, MA, Hartford, CT and Colorado Springs, CO, where she was exposed to a variety of patient populations including those with primarily orthopedic, neuromuscular and sports-related injuries. Originally from Glastonbury, CT, Allie was a varsity athlete with a love for basketball, playing in tournaments all over the United States. In her free time, Allie enjoys hiking, running, traveling, and is an avid Boston sports fan. 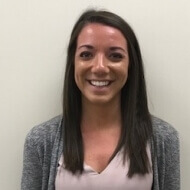 Allie enjoys working closely with patients to build an individualized plan of care. She strives to provide her patients with a fun, active, and functionally driven environment to help them return to what they love to do.